In this booklet, K.P. 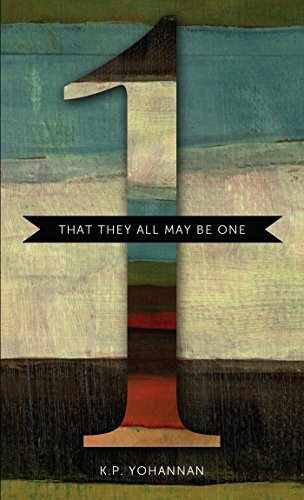 Yohannan opens up his heart and shares from past struggles and real-life examples on how to maintain unity with those in our lives. A must read! You are part of the family of God—not fragmented, not divided—but with one heart, one soul and one mind. You are called to live together, strive together, pray together, suffer together, agonize together—and if need be die together—with your brothers and sisters for the sake of a world that has never heard the name of the Lord Jesus. This is our privilege and this is our calling. Let us all then love and live in unity as one Body, one in Him. We pray, O Lord, that You would continue to bind us together with love—love that covers a multitude of sins, love that is so patient, gentle, forgiving and caring. Love that does not go around finding people’s faults and criticizing others but love that always gives in. Help us to be humble and broken and to consider others as better than ourselves. Make us more like You, Jesus. Next time we will begin K.P.’s book called Stay Encouraged. It will bless you! This entry was posted in That They All May Be One and tagged belief, believe, Bible, Christian, Christianity, church, dependence, Discipleship, encouragement, Failure, faith, gfa, God, Gospel for Asia, Him, holy spirit, Hope, Jesus, Jesus Christ, K.P. Yohannan, kingdom of God, Lord, ministry, Missions, organization, parachurch, pray, prayer, principles, service, unity on October 26, 2010 by gfaseo. He was despised and rejected by men, a man of sorrows, and familiar with suffering. Like one from whom men hide their faces he was despised, and we esteemed him not. We all, like sheep, have gone astray, each of us has turned to his own way; and the LORD has laid on him the iniquity of us all. He was oppressed and afflicted, yet he did not open his mouth; he was led like a lamb to the slaughter, and as a sheep before her shearers is silent, so he did not open his mouth (Isaiah 53:3, 6–7, NIV, emphasis mine). Think about the magnitude of these verses. The Son of God, who was there when the heavens and earth were first formed, chose to come to this earth not as an esteemed and highly respected man, but as a helpless baby born in a dirty stable to a poor, unwed mother. To take it further, He died the death of a lawbreaker. The only perfect man ever to live without sin on this earth died on a cross between two thieves. Even with 12 legions of angels at His disposal (see Matthew 26:53) ready and able to stop this great injustice from happening, Jesus chose to remain there—to be broken and humbled and to die. If ever there were a man with the right to fight for himself and against the wrong done to him, it would have been Jesus. But He did not. He never opened His mouth against His accusers or in His own defense, but only said, “Father, forgive them . . . ” (Luke 23:34). Only when I compare myself with Christ am I able to humble myself with all of my heart. What breaks relationships and sows disunity is my thinking I am better than somebody else, that my way is right or that my conviction is better than another’s. But when I compare myself with Christ, who am I? Who am I to say, “I am right”? Who am I to stand up for the way I think things should be? Scripture says, “Let this mind be in you which was also in Christ Jesus, who, being in the form of God, did not consider it robbery to be equal with God, but made Himself of no reputation, taking the form of a bondservant” (Philippians 2:5–7). It is when we choose to have “this mind in us,” to see Jesus and follow Him in our relationships, that He will be exalted in our lives, in our brother’s life, in the Church and throughout the nations. Is this not our ultimate goal, to exalt and bring honor to the name of Christ? When we choose to walk in love and humility toward one another as He did—even to the very ones who crucified Him—we will see Him exalted. The world will know we are His disciples by our love for each other, and they will come to bow before Him because of this love. Recently a brother who serves with our movement came to me upset about a particular situation involving some of the people he works with. When he came to talk to me about it, I knew from the moment he entered the room how upset he was. There was silence, and then the conversation continued. I said, “Even though you are correct, would you still ask others to forgive you for your lack of love in handling the situation? Would you bend and break even when you are right?” Jesus did. He could have come down from the cross and proven He was God. But Jesus didn’t do it this way. And by the grace of God, neither did this brother. The next day, even though he was right and the facts were in his favor, he went and asked the others involved in the situation to forgive him. It is this kind of submission and humility that binds us together and through which Christ is exalted in our lives and on the earth. What I am finding out about myself in dealing with people is that the problem is not outside. It is not the people who keep coming to me, pestering me, beating me, calling me names and telling me how to do things. The problem is that my own heart doesn’t want to bend and break and respond as Christ would, in genuine love and humility. Let us strive toward this end. “Therefore be imitators of God as dear children. And walk in love, as Christ also has loved us and given Himself for us, an offering and a sacrifice to God for a sweet-smelling aroma” (Ephesians 5:1–2). This entry was posted in That They All May Be One and tagged belief, believe, Bible, Christian, Christianity, church, Discipleship, encouragement, Failure, faith, God, Gospel for Asia, Him, holy spirit, Hope, Jesus, K.P. Yohannan, kingdom of God, Lord, Missionaries, Missions, organization, parachurch, pray, prayer, service, unity on October 21, 2010 by gfaseo. Therefore if there is any consolation in Christ, if any comfort of love, if any fellowship of the Spirit, if any affection and mercy, fulfill my joy by being like-minded, having the same love, being of one accord, of one mind. Let nothing be done through selfish ambition or conceit, but in lowliness of mind. Let each esteem others better than himself. Let each of you look out not only for his own interests, but also for the interests of others (Philippians 2:1–4). I used to be a fighter. I fought for my doctrines. I fought for my way of ministry. I must have been one of the most difficult human beings to live or work with. I won every argument and always got things to go the way I wanted them to. But in reality, every argument I won I really lost because I lost the people—I alienated the Body of Christ around me. Every time I won, I hurt my brothers and sisters, as well as God, because I would not choose to do things His way—the way of love and humility. But praise God that He didn’t give up on me. Slowly I began to understand the importance of submitting to my brothers and to my sisters, truly loving them. I used to be absolutely radical about my theological doctrines. Even now, there is a whole theological world that fights over so many different points of view on a variety of subjects. Volumes are written containing thousands of pages debating these different opinions. Yet the root of all these arguments and debates is really hardness of heart and a lack of love. Any doctrine or form of “Christianity” that is not spoken and upheld in love, that induces people to continually fight for their side, creates disunity and rips the Body of Christ apart. When we handle our pain, our rights, our gifts or our talents without love, we are walking on dangerous ground. It does not matter how right we may be in standing for truth—if what we say is not done in the love and humility of Christ, disunity will result. But there is joy and life in giving in to the ways of God and being broken and humbled. A few years ago I attended a pastors conference in California. I was scheduled to share on missions along with a couple other speakers from across the United States. To be honest, I didn’t like one of the other plenary speakers at this missions conference. This man had written some articles that I thought were really destructive to the work of God. As I remembered the things he wrote, I began to get very upset over the whole situation. I couldn’t believe he was invited to the conference to speak on missions. As I started to speak before the assembly full of people, I made an unkind, unloving comment about him. I considered myself justified in what I said because I thought the damage he did to the kingdom’s work was great. Though I speak with the tongues of men and of angels, but have not love, I have become sounding brass or a clanging cymbal. And though I have the gift of prophecy, and understand all mysteries and all knowledge, and though I have all faith, so that I could remove mountains, but have not love, I am nothing. And though I bestow all my goods to feed the poor, and though I give my body to be burned, but have not love, it profits me nothing (1 Corinthians 13:1–3). The beauty of this whole incident is that when I humbled myself and sought forgiveness, this man that I had spoken against responded back to me. He had received the letter that was sent to all who attended the conference and read of my asking forgiveness. He called me and thanked me for my humility, saying, “Brother K.P., no wonder God is using you so much. No wonder God’s grace is upon your life.” And I said, “Thank you for saying that to me.” God knows how hard it was for me to humble myself and ask for forgiveness. But He is faithful to give us the grace and strength to submit to others and admit when we are wrong. In 1 Corinthians 5, Paul describes a situation of a man living in blatant, unconfessed sin. It took great love for Paul to put this man out of the church. Maybe it sounds horrible and unkind, but Paul did it with a firm, tough love. And look at the result. In 2 Corinthians 2, that man was restored to fellowship again. This kind of love—God’s kind of love—always brings unity to the Body of Christ. It is a tough yet humble love that gives in but doesn’t give up. If we really desire to be like Jesus and to walk in love and power as He did, we must humble ourselves. We cannot just underline Scriptures on humility in our Bibles and never implement them into our lives. Scripture is practical, and we must live it out to experience its transforming power in our lives and relationships. We have to be willing to bend and break and live a life of “not [thinking] of [ourselves] more highly than [we] ought to think” (Romans 12:3). We have to “honor [and give] preference to one another” in real ways, everyday (see Romans 12:10). This is what I believe the Lord desires for each and every person who confesses His name, whether in full-time ministry or not. God is looking for lowly hearts that are ready to be filled with His love and power. He is looking for a Body ready to be broken for the millions who are spiritually starving because they do not know Jesus. Only to the measure that we are willing to bend and submit to one another will we experience the unity and love that Christ can bind us together with. And it is the people who dwell in unity on which He said He would command His blessing (see Psalm 133). This entry was posted in That They All May Be One and tagged Bible, Christianity, church, dependence, encouragement, Failure, faith, gfa, God, Gospel for Asia, Him, Hope, Jesus, Jesus Christ, kingdom of God, Lord, Missionaries, Missions, organization, parachurch, prayer, principles, unity on October 19, 2010 by gfaseo. This entry was posted in That They All May Be One and tagged belief, believe, Bible, Christian, Christianity, church, dependence, encouragement, faith, gfa, Gospel for Asia, Him, holy spirit, Hope, Jesus, K.P. Yohannan, kingdom of God, Lord, Missionaries, Missions, pray, prayer, service, unity on October 14, 2010 by gfaseo. This entry was posted in That They All May Be One and tagged belief, believe, Bible, Christian, Christianity, church, dependence, Discipleship, encouragement, faith, gfa, God, Gospel for Asia, Him, holy spirit, Hope, hopeless, Jesus, Jesus Christ, K.P. Yohannan, kingdom of God, living water, Lord, ministry, Missionaries, Missions, pray, prayer, service, unity on October 12, 2010 by gfaseo. In 1 Kings 18:31, when the prophet Elijah repaired the broken altar, we are told he used 12 stones, “according to the number of the tribes of the sons of Jacob, to whom the word of the LORD had come . . .” This is an interesting statement, because at the time of this account the children of Israel were splintered into various groups, fragmented and backslidden in heart. Yet despite their condition, God still referred to them as one, together chosen as His children. It was on that restored altar, with the stones representing the 12 tribes of Israel, that God made His great power known by defeating the prophets of Baal. But consider this: Would that altar have been complete with only 11 of the stones or 8 of the stones representing the tribes of Israel? No, it would not have been. It was all 12 stones that were recognized by God and all 12 through which He made His power known. We can learn a lot from this Old Testament example. Another beautiful illustration of how we are to be united as one is found in the temple Solomon built in Jerusalem. It is said that each stone used in its building was chipped at and carved away until it fit perfectly with the stones around it—so perfectly that no mortar was even needed to hold them together. Each individual stone fit perfectly with the others, becoming one beautiful temple for the Lord. This is what the Lord desires for us today. You see, rather than dwelling in a temple made with human hands as in the days of old, God has now chosen instead to dwell within us, His temple made with living stones—you and I (see 1 Peter 2:5). Like the stones used to build the temple, God desires His living stones to fit together perfectly by the unity of His Spirit and the bond of love. The kingdom of God is a relational kingdom. Think about it; Jesus didn’t ask us to only pray alone. He said, “For where two or three are gathered together in My name, I am there in the midst of them” (Matthew 18:20, emphasis mine). Neither did He send out the disciples individually but rather two by two (see Mark 6). His purpose in doing things this way was so that they would be able to minister to each other and support one another as they reached out to the lost around them, and so that the world, by observing the disciples’ love for one another, would know the love of God. During Jesus’ last few moments before going to the cross, He left His disciples not with a series of steps on how to reach the lost. He did not sit them down with notebooks and pens or have them memorize certain methods, techniques or anything else. To prepare them for the enormous task ahead, He simply left this powerful statement: “By this all men will know that you are my disciples, if you love one another” (John 13:35, NIV, emphasis mine). What is disunity except the lack of love? When we recognize the importance that Jesus placed upon loving one another above all else, and we begin to walk in obedience to His command, nothing will be able to hinder us from seeing the kingdom of God come in our generation! This entry was posted in That They All May Be One and tagged belief, believe, Bible, Christian, Christianity, church, dependence, Discipleship, encouragement, faith, gfa, gifts, God, Gospel for Asia, Him, holy spirit, Hope, Jesus, Jesus Christ, K.P. Yohannan, Lord, ministry, Missionaries, Missions, pray, prayer, service, unity on October 7, 2010 by gfaseo. It is my prayer that the Lord would give us an understanding of true unity and help us to put into practice the “laws of a living fellowship.” We were not called to be individuals doing our own thing. We were called into the family of God, to oneness and unity with Him and with our fellowman. May we strive to maintain this unity, each day linking arms with our brothers and sisters, genuinely loving each other and laboring together to see the kingdom of God come. This entry was posted in That They All May Be One and tagged believe, Bible, Christian, Christianity, church, dependence, encouragement, faith, gfa, God, Gospel for Asia, Him, holy spirit, Hope, Jesus, Jesus Christ, Lord, ministry, Missionaries, Missions, pray, prayer, service, unity on October 5, 2010 by gfaseo.